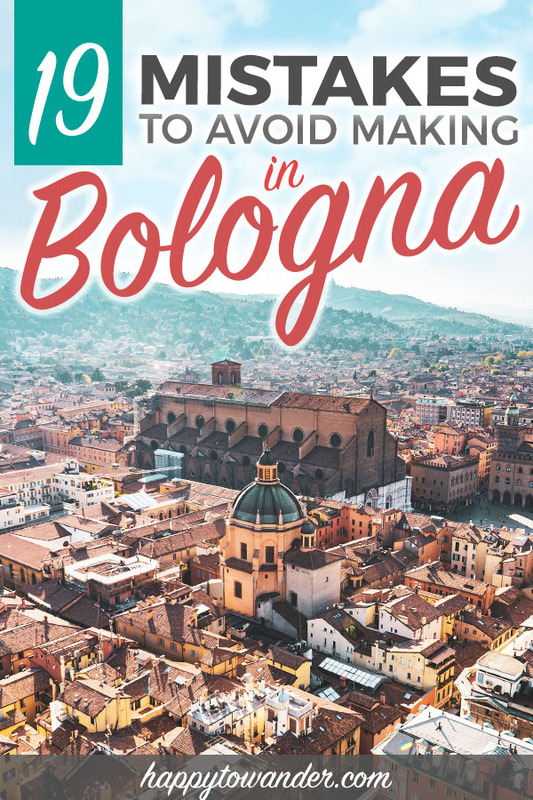 This article about mistakes to avoid when you visit Bologna was produced in collaboration with Emilia Romagna Tourism and Bologna Welcome, who hosted me during their Blogville campaign. I hope you enjoy these tips! 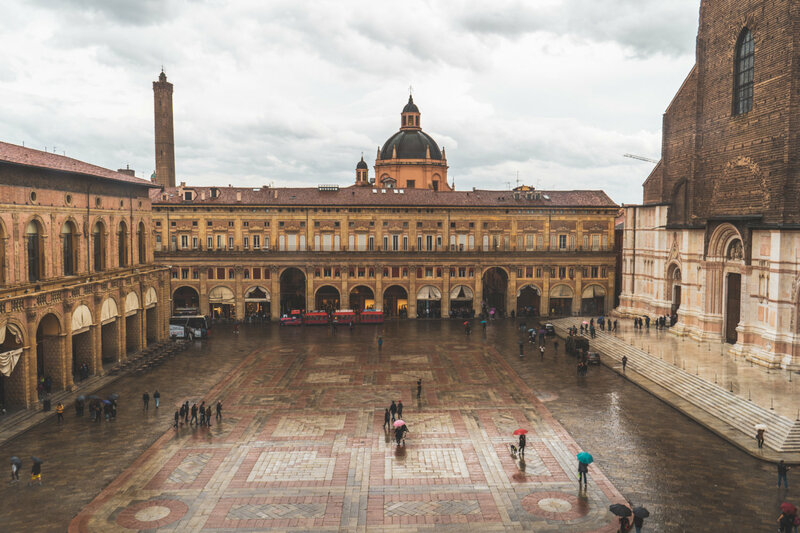 If you’ve stalked me on Instagram lately, or had the misfortune of hearing me rave in person, you might know about my latest travel crush: a small, delicious city by the name of Bologna, Italy. I must admit, for about two weeks after I returned, I was insufferable. My visit to this city turned me into a relentless robot programmed to start every sentence with “when I was in Bologna…” I even caught myself hand rolling tagliatelle one night in my tiny Munich kitchen, trying in vain to recreate the magic. Honestly speaking, I’m surprised I still have friends. But hey, now that the dust has settled and I’ve eaten the last of my kilogram of tortellini I smuggled home in my suitcase, I’m ready to finally speak coherent sentences about my time in Bologna. … So why “mistakes” then? Well, let’s just say, after a week attempting to live like a local, I was able to make my fair share of them. And while Bologna is a wonderful city best savoured slowly, it’s also one where easy mistakes can ruin your finely laid plans. 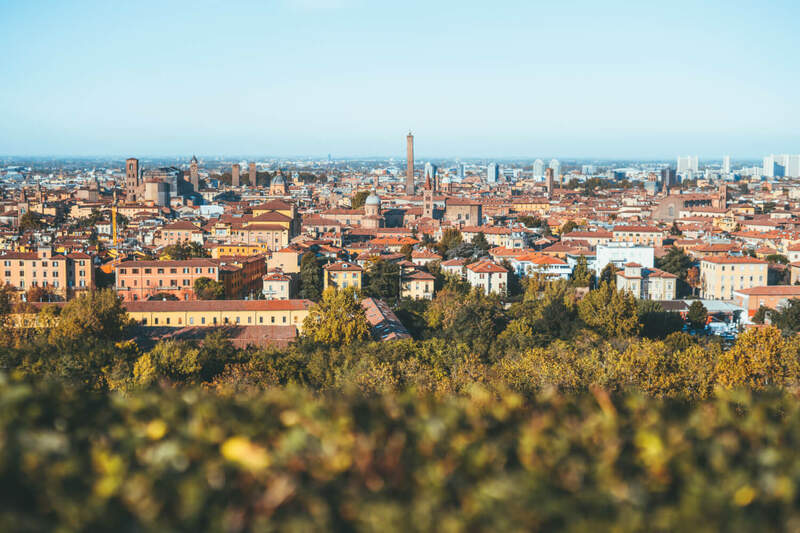 And so, here’s a Bologna travel guide to help you make the most of your time in Emilia Romagna’s tasty capital, filled with silly mistakes you should avoid. Enjoy! Thou shalt not order a Spaghetti Bolognese. While I love a good spag bol when I’m at home, one of the quickest things I learned in Bologna was that no, there is no such thing as a spaghetti bolognese here. First off – their meat sauce is known as ragù (it’s delicious minced meat simmered slowly to perfection with tomatoes, red wine, celery, carrots and onions). Secondly, having spaghetti with ragù is considered a crime – the structural integrity of those flimsy little noodles can’t uphold the rich sauce. 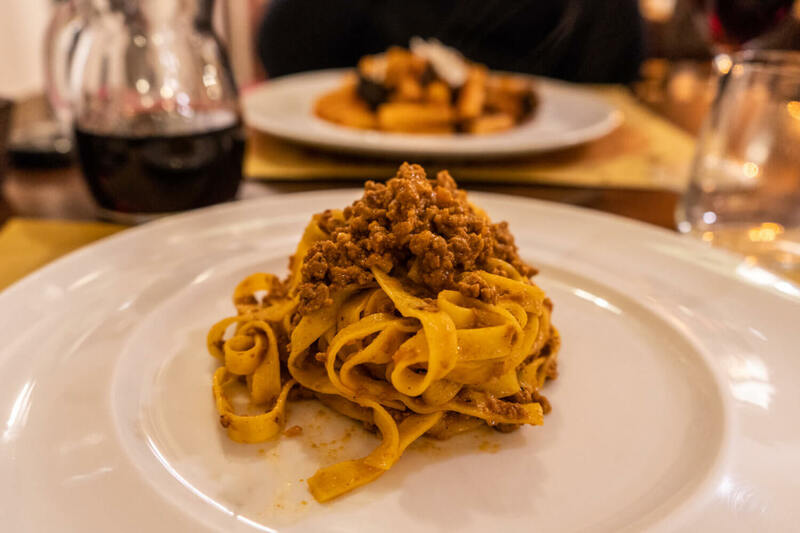 SO, remember: if you want the best “spaghetti bolognese” of your life, march into a Bologna restaurant and get yourself a “tagliatelle al ragù “. Thou shalt not ask for ‘baloney’. I know: it’s confusing. Having grown up in North America, where the word “BOLOGNA” stood for a mysterious circular pink meat, it’s easy to think you could step into any eatery and ask to try some local baloney for yourself. What you actually want is mortadaella, a sausage similar in taste to North American baloney, but much better in texture and depth of flavour. Usually it’s served in cubes or thin slices (which is when it most resembles American baloney). Fettuccine alfredo, spaghetti and meatballs, etc. are not things here. If you really want to get beat up, try ordering a Hawaiian pizza 😉 Just joking… although this video of Neopolitans reacting to pineapple pizza will never not be funny to me. Thou shalt not order a cappuccino after 11am, and certainly not after a meal. While a post-meal coffee is common practice in Italy, if you want to quickly and surely horrify an Italian person, ask for a cappuccino when the waiter comes round. Because consuming a bunch of milk after a heavy meal (and outside of breakfast) is considered strange, you might get a few weird looks (or made fun of, which yes, has happened). Thou shalt not order a pepperoni pizza. This will give you a pizza topped with peppers. Yes, this was learned through personal experience once upon a time. Fret not, my little pepperoni, what you want instead is a pizza with spicy salami. Thou shalt not order a latte. A latte is “milk” in Italian. Servers will have no qualms with serving you a literal glass of milk if you order a latte, and yes I’ve witnessed this happening. Ask instead for a latte macchiato (milk “marked” with a shot of espresso). 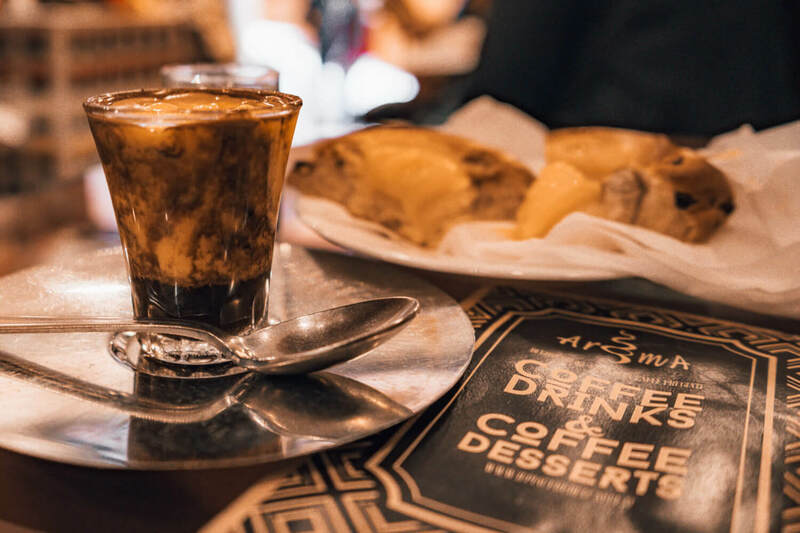 BONUS TIP: The “to go” coffee culture really isn’t big here, so don’t expect every cafe to have takeaway options. Most likely you’ll want to stand at the bar and have your coffee quickly as the locals do (it costs extra to sit down). Okay so with food out of the way, let’s talk about another common mistake: staying somewhere noisy. The truth is, Bologna is…….. lively. This is great when you want to be out having fun. It is NOT great however when it’s 3am, and you can hear some guy shouting Ed Sheeran so loudly, he’s practically in your bedroom. Bologna is a fun city full of people who want to have a good time (especially students!). This inevitably means that some hotspots are always going to be loud and busy. If you’re a light sleeper, I’d recommend finding accommodation on a quiet street, well out of the way of hotspots. 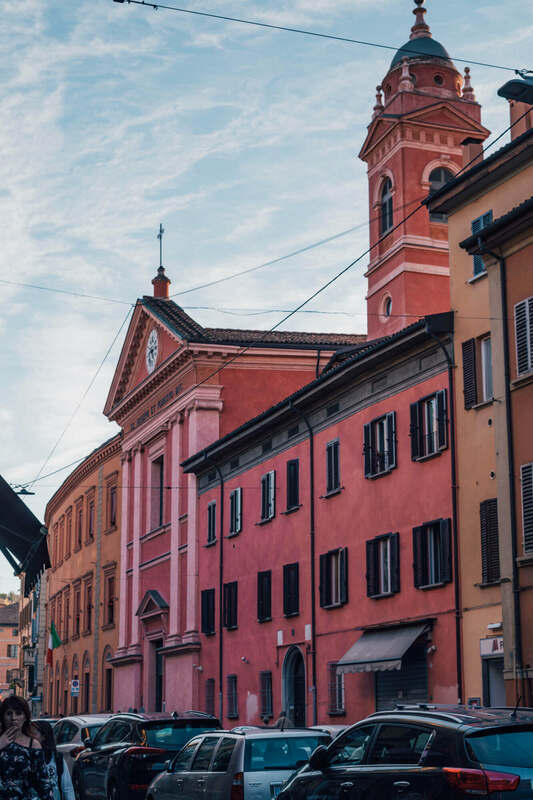 Bologna is small and walkable, so even if you stay a little farther away from the main hubs, you’re never too far from important Bologna points of interest. When in doubt, stalk reviews! 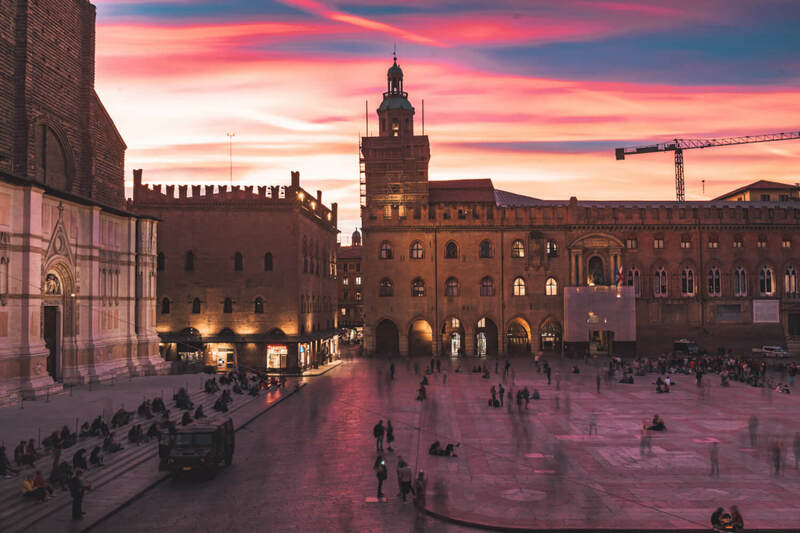 Bologna is a city that rewards early risers, from gorgeous pink sunrises to empty streets ripe for frolicking. Therefore, avoid saving ALL of your sightseeing for the peak afternoon hours. Like in any other big city, this is a sure recipe for crowds, line-ups and awkwardly waiting for people to move. Instead, capitalize on one of the best things to do in Bologna: exploring before all the other sleepyheads escape their beds. I visited the Basilica of San Petronio as soon as it opened and literally had the whole place to myself! In my opinion, Bologna sightseeing is best enjoyed on foot! 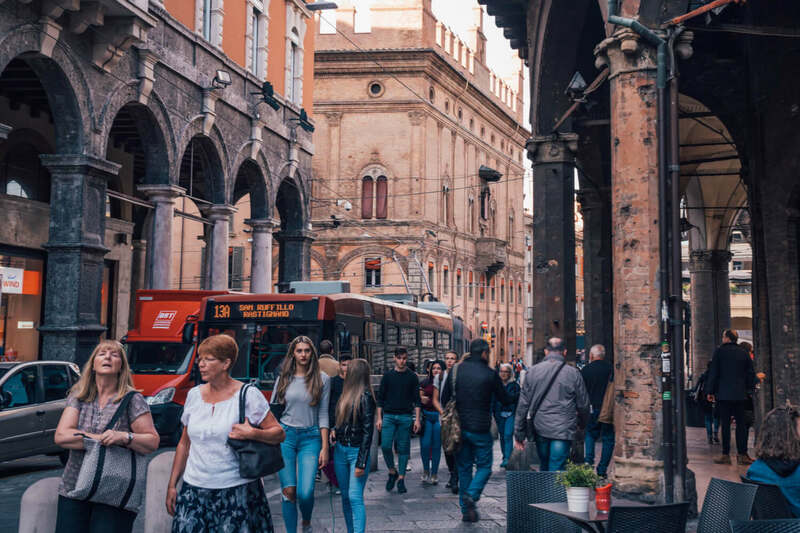 And while there is plenty of public transport in the city, bus travel doesn’t really do Bologna justice, so take advantage of the city’s walkability and walk as much as you can. PS: Take some time to walk down little side streets and get a little lost too. Scattered all around the city are palatial buildings obscured by gates, little gardens hidden from plain sight and so much more than meets the eye. 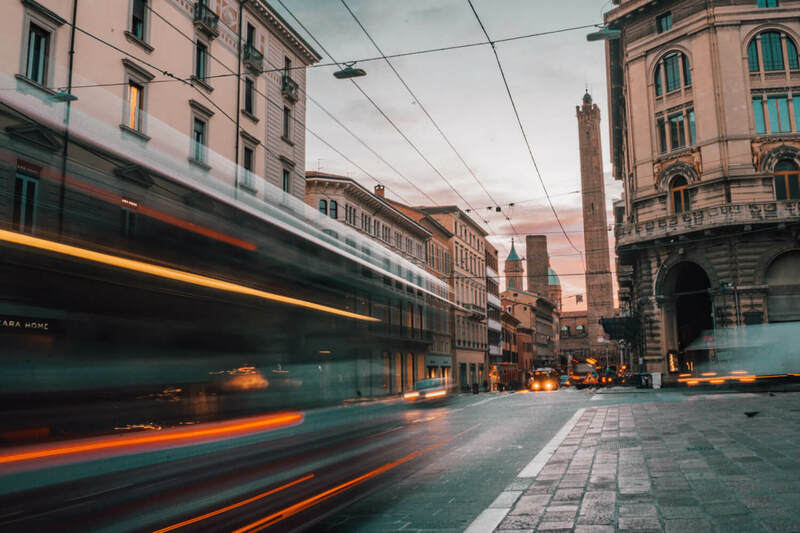 While I didn’t take the bus much in Bologna (apart from getting to/from the airport), a quick search on forums reveals a surprising number of visitors who get dinged by unforgiving officials for riding the bus wrong, so I needed to include it here! Without sugarcoating, buses in Bologna can be confusing. Not only do you need a ticket, you need to validate it properly in order to avoid a fine. While in theory, there ARE some (cash only) machines on buses where you can buy tickets on board, there are several accounts of them often not working or simply not existing on certain buses. Your better bet is to pre-buy tickets at either the electronic machines at train/bus stations OR just look for a “Tabacchi” shop (marked with a big T) and validate your tickets once on board. NOTE: Ticket validation is serious business in Bologna! On my airport bus, we were horrifically delayed so lots of people got in through the back door. To ensure that everybody had properly validated tickets, we banded together like the Care Bears and passed everyone’s ticket down a line to get them stamped. I can’t lie to you, it was extremely cute. Bologna, from what I noticed, is still pretty cash-heavy. Although many establishments will take card these days, it’s a safer bet to just have some cash on you at all times to be safe, especially for smaller shops (which might require a minimum spend for card usage) and especially for public transportation. We English speakers are extremely spoiled during our travels. In most places I’ve visited, basic English is pretty much a given. In Bologna, I felt this was less so. While most younger students and those working in service spoke some English, there were definitely quite a few instances where I would get replies in frustrated Italian. This is kind of fun though – take it as your opportunity to practice the fluid sing song of Italian conversation. For what it’s worth, no one ever scoffed at my attempts, but honestly, 99% of my interactions came in gelato shops, and “Straciatella” is kind of pronounced the same no matter where you go. Anyways, remember: brush up on some basic Italian to make your life easier! 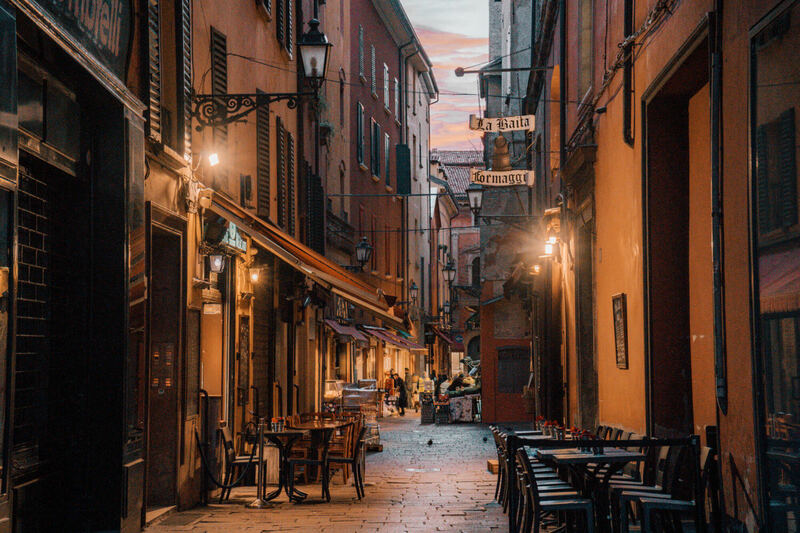 Another key mistake that visitors often make is they hit up all the main hotspots and leave behind the wealth of cool, offbeat sights that Bologna has to offer. Here’s my opinion: don’t restrict your Bologna sightseeing solely to the most popular places in the city! 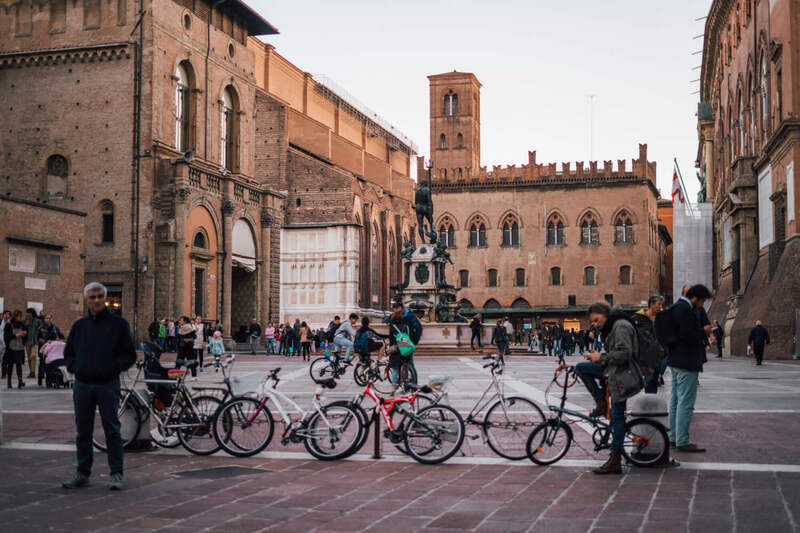 Most visitors to Bologna will frolic to the usual suspects like the Quadrilatero, Piazza Maggiore and the Due Torri, but there are a lot more things to do in Bologna than just those. 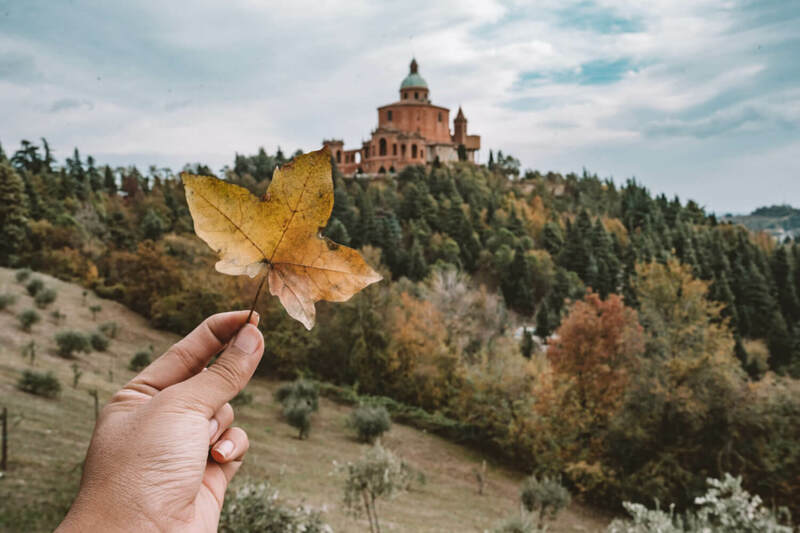 Santuario di San Luca: Not totally offbeat, in fact it’s quite famous, but a lot of visitors miss the Santuario di San Luca because they think it’s too far or not worth a visit. To me, the Santuario di San Luca is a real Bologna must see. Not only does it have the longest portico in the world leading up to it, seeing the sandy pink church surrounded by lush green trees is quite the sight. If you’re daunted by the prospect of walking up, do as I did and take the (very touristy) San Luca Express, a little toy train that whizzes you all the way up for 10 euros. Can you be-leaf this view? The Church of Santa Maria della Vita: In the heart of the Quadrilatero is this little church, just off of Piazza Maggiore where you’ll find the famous Compianto del Cristo Morto (Lamentation over the Dead Christ), well-regarded as one of the most magnificent examples of Italian sculpture. Istituto di Anatomia Umana Normale: Some of the oldest wax anatomical models are on display here for free, which is either awesome or terrifying depending on your preferences, but it’s nonetheless a macabre and interesting sight that most tourists miss. Saint Catherine of Bologna: While “mummified nun on a golden throne” sounds like a great premise for a horror film, I assure you this is a real thing you can see and visit in Bologna. Housed in the Chiesa della Santa, the only thing creepier perhaps is the fact that you need to ring a mysterious doorbell to be buzzed in to see Catherine (who has perched upright on her throne for 500 years) for yourself. Oh, she’s also apparently surrounded fingers, toes and skulls. Needless to say, I couldn’t bring myself to do this, but you can learn more here. Museum for the Memory of Ustica: While not that well known outside of Italy, June 1980 marked one of the greatest tragedies in Italian history, and one that remains shrouded in mystery, controversy and conspiracy to this day: the Ustica Massacre. Aerolinee Itavia Flight 870 was a flight bound for Palermo from Bologna. Shortly before landing, the plane crashed near the island of Ustica, killing all 81 on board. This museum was opened as a memorial for the victims of the crash. Most notably, it contains the actual wreckage of the plane, alongside haunting pieces meant memorialize the victims. Bologna’s street art: One little thing I loved keeping an eye out for while in Bologna was the countless murals, graffiti and street art around the city. There are certainly huge murals outside of the city center, but even in the central areas, I noticed artists often made use of closed shop gates to paint a cool design (another reason you should get up and explore early!) If you want to see some of Bologna’s street art for yourself, this Italian website has a full map of big murals around Bologna for you to check out. Forte Torre Chiesa Evangelica: This church is a little out of the way, but I needed to include it because it’s so cute. The Forte Torre Chiesa Evangelica is a darling pink church I randomly came across while walking back into town from the San Michele in Bosco. I’m quite confident in any other city, it would be Instagram-famous, yet here it is, blissfully untapped. This sounds like an obvious tip, but a necessary one. Throughout the week, as I stalkerishly perched from my window overlooking Piazza Maggiore, one baffling phenomenon I consistently witnessed was that people would pass through the square, snap some selfies, then scurry off, not actually entering the many buildings surrounding the square. Biblioteca Salaborsa: Located right by the Fountain of Neptune, this public library is best known for its glass floor which showcases Roman ruins (which you don’t see too many of in Bologna) BUT I find the spectacular architecture and beautiful ceiling more worthy of my drool. Sala Farnese: Located in the Palazzo d’Accursio alongside the Biblioteca Salaborsa is the nicest view over Piazza Maggiore that you can get for free. All you need to do is walk in and take two flights of stairs up, following the signs for the “Sala Farnese”. The view from here is a real Bologna must-see. Basilica of Santo Stefano: If you find yourself in Piazza Santo Stefano, don’t forget to head inside the Basilica, which is actually a complex of multiple churches, hence its nickname “The Seven Churches”. This is a truly unique sight that I haven’t seen anywhere else in the world. Be sure to put it on your list! Basilica of San Domenico: What if I told you Bologna has its own Michelangelo original…… and nobody knows about it?! Thanks to my local friend Silvia from Bologna Uncovered, I got to check out Bologna’s Basilica of San Domenico, a gorgeous church with an angel candle holder designed by Michelangelo himself. The Archiginnasio and its Anatomical Theatre: Last but not least, while this isn’t a hidden gem by any means, I would urge you to take the time to thoroughly explore the Archiginnasio and pay the small 3 euro fee to visit the Anatomical Theatre. It’s an eerie place. After all, this is where some of the first human dissections for scientific/research purposes were performed! If that makes you feel queasy, the Archiginnasio is also filled with some gorgeous ceilings and artwork to admire. Next: I need to let you know that Bologna is not a great city to attempt spontaneity, that is, if you’re really keen to see some of the city’s top attractions. The starring attraction, Asinelli Tower for example must be reserved in advance… and trust me: the line gets looooong. To avoid disappointment, reserve a time slot in advance to climb the tower here. I suggest choosing one early in the morning. We went in the middle of the day and it was far too crowded for my liking! The same principle applies to popular restaurants: always make a booking in advance! San Michele in Bosco: A mini hike if you choose to walk it, but you do go through a nice part of town and the view is of course unbeatable. Sala Farnese: Located right in the middle of the city, gazing over Piazza Maggiore. To access it, simply walk into the Palazzo d’Accursio, look for the stairs, head up two flights and turn left. You’ll see some signs that will point you in the right direction! 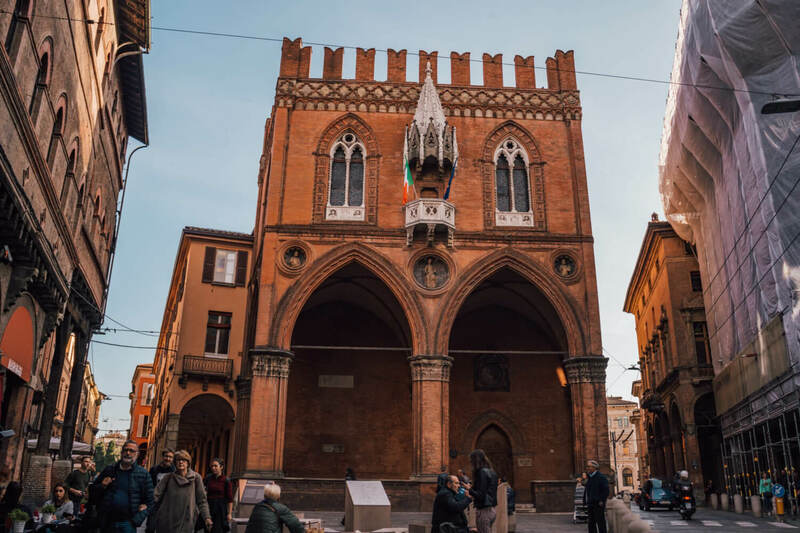 Guidebooks and online articles seem to love talking about the extremely mysterious Seven Secrets of Bologna, little hidden ‘easter eggs’ that are scattered around the city for those clever enough to discover them. Many of these are “hidden in plain sight” types of secrets, from centuries-old inscriptions about cannabis, walls next to Piazza Maggiore that whisper, Venetian canals and um… hidden sculptural odes to male “virility” on Bologna’s most beloved statue. While I didn’t have time to seek out all these secrets for myself (though some I did – can confirm: Neptune is well endowed), I love this blog post via La Brutta Figura, who systematically researched and went to see each of these secrets for herself. Spoiler: some might not exist! Kind of niche advice for anyone who’s renting a car, but beware: driving in the city centre as a tourist is only allowed with a permit. Learn more here. Water isn’t free: Tap water isn’t really a thing here. They don’t drink it. When you order water at a restaurant (even if it’s just regular still water) you’ll be paying by the bottle. There’s a “coperto charge”: A “coperto” charge, or cover charge, is a prominent part of most restaurant bills. Don’t be shocked – it’s not a scam, think of it as a service charge plus a charge for bread. It’s typically charged per person. 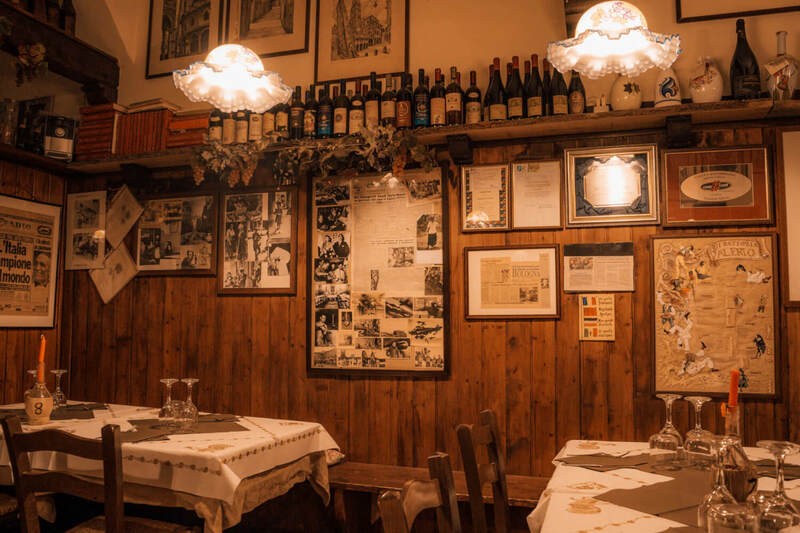 Service might not be as quick as you’re used to: I actually love this about Italian service – they don’t rush you at all and are usually quite slow at bringing out dishes. This means more time to chat and enjoy! That said, it’s a little different to the quick service I’m used to at home, so it’s a good one to keep in mind. PS: you also have to actively ask the server for your bill, they won’t bring it out in a non-subtle attempt to shoo you out like they often do in North America. Assuming every restaurant will be good: There’s a silly, naive belief among us North Americans that Italy is a food haven where around every corner there’s a life-changing restaurant. As much as I would like to indulge this utopian fantasy, it’s simply not true. Italy (and Bologna), much like any other place in the world, has bad restaurants as they do good ones. SO, don’t expect to just stumble upon a random place and have sky high expectations. I did this one lunch and was very sad. You need to research, lest you be woefully let down. 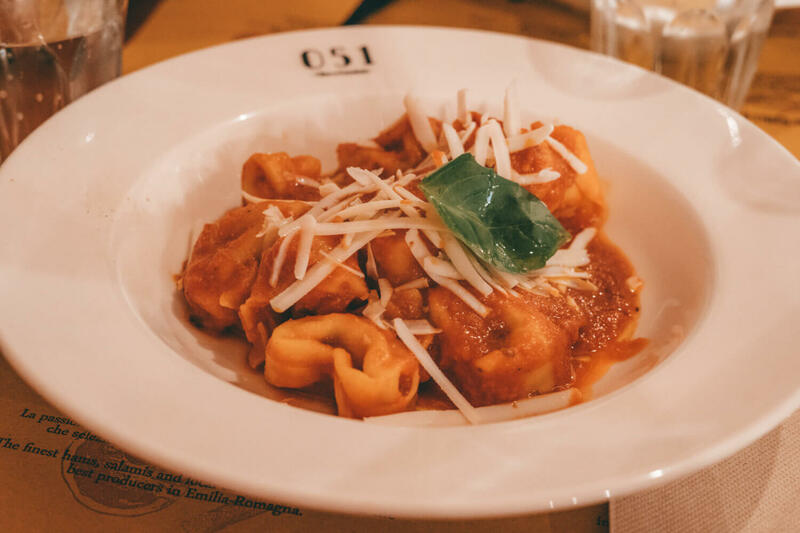 If you want a list of dependable eats, check out this roundup of delicious osteri from my local friend Silvia, who runs a great Bologna blog filled with locals tips and secrets. This is kind of a contentious issue, and one that you can Google at length if you enjoy petty Internet arguments & angry people telling each other they’re wrong, BUT it is a generally accepted fact that you don’t need to tip as much in Italy as you may do in North America. Some say tips aren’t expected at all (unless with exceptional service), but again – opinions vary. What I will say is you will never need to tip as much in Bologna as you do back home (where 15-20% is the norm). I usually just round up, and even once when I did this, the waitress was very very surprised and happy at my measley 2 euro tip. Basically, don’t stress too much about tipping in Bologna, it’s not generally expected, though I’m sure it’s welcome. Needless to say, like in any big city, the areas most frequented by tourists will have inflated prices. Luckily, in Bologna, this doesn’t usually come at the sacrifice of good quality, but still something to be mindful of. After all, this is how I ended up buying 37 euros worth of (admittedly, very delicious) but expensive tortellini! The stalls in the Quadrilatero are definitely pricier than if you were to shop farther away from the city center. The cheapest though was going to the source! I happily bought blocks of parmesan from the dairy we visited, alongside balsamic vinegar from the producer himself for a fraction of the prices I saw in the center. But crossing the street! Wow. Bologna’s roads are a mix of whizzing mopeds, impatient cars and the occasional bus here and there. Coming from overpolite Canada where pedestrians are treated like royalty, I found myself petrified at the prospect of something as basic as crossing the street. Here’s my tip: wait until a local is crossing then follow them closely behind. Don’t get run over! I intentionally brought an additional duffel in anticipation of all my shopping, and I’m glad I did! Honestly, when you come to a foodie paradise like Bologna, you should expect to fill your suitcase with plenty of yummy souvenirs. Trust me, you’re going to taste balsamic vinegar so delicious, you’ll want to buy twenty litres of it, so leave some space in your bag, or bring an extra one. 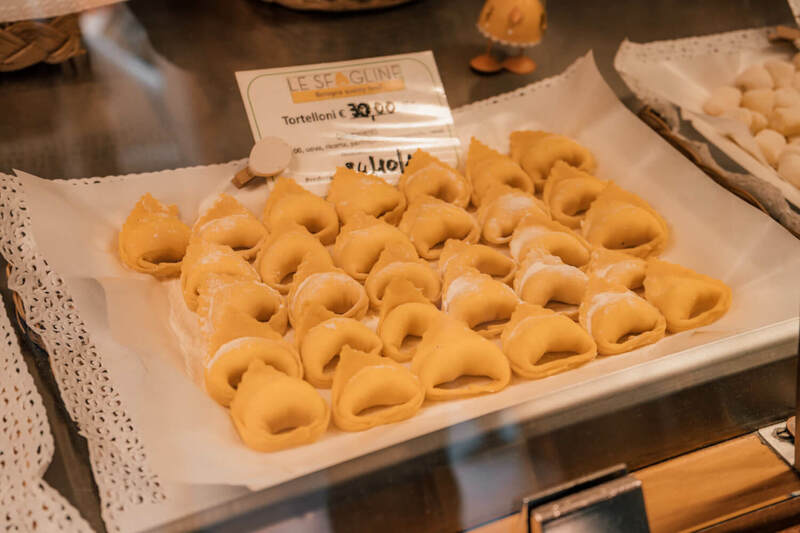 WARNING: Eat all the tortelloni you can though because it doesn’t travel well and the expert pasta ladies won’t even sell it to you if they hear their creations will be ruined in transit! Okay, last but not least, if you’re relying on the airport shuttle to get from Bologna Centrale to Bologna Airport, please leave yourself a LOT of extra time. I have to say: the airport shuttle bus is a HOT mess. Here was my experience in the middle of the afternoon: not only did the bus arrive 20 minutes late, there seemed to be no support/no one who knew why or what was going on. Added onto that, the ticket machine closest to the bus was broken, so people had to run inside to get a ticket (though I got one from a local Tabacci). There was also no real line-up – people began to cluster near the front and the line was spilling out into the road – it was really bad. The traffic was perhaps worse. The guy next to me arrived at the airport with only 20 minutes before his flight… which I’m almost 100% sure he didn’t make because the bottle neck effect at the security line-up is also bananas. The line-ups get long and are processed slowly, so please leave yourself extra time! Any more questions about Bologna & what to do? I hope you enjoyed this Bologna travel guide! If you have any more questions about Bologna, places to visit in Bologna, or anything else, let me know in the comments! Next ArticleStuttgart Christmas Market Guide: Where to Go, What to Eat & More! OMG I love your commandments – hilarious! I had no idea about the coffee culture there! That’s a massive heads up about ordering a cappuccino. Such an interesting post and amazing pics!